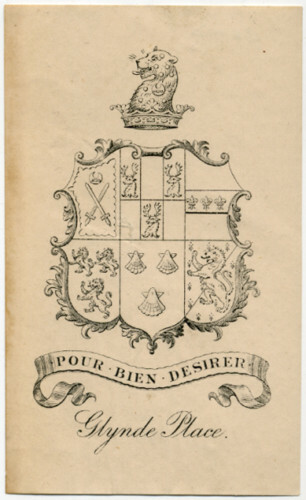 Currently on sale at eBay is the heraldic bookplate listed as Brand of Glynde Place, Sussex. Quarterly of six: 1st Azure two swords in saltire Argent hilts and pommels Or within a bordure engrailed Or a crescent surmounted with a label for difference (Brand); 2nd Per fesse Azure and Or a pale counterchanged and three bucks’ heads erased of the second (Roper); 3rd Or on a fesse Gules three fleur-de-lys of the field (Lennard); 4th Azure three lions rampant Or (Fiennes); 5th Gules three escallops Or (Dacre); 6th Per bend sinister ermine and ermines a lion rampant Or (Trevor). My first point of call when trying to identify the various quarters was the 1929 edition of Fox-Davies’ Armorial Families. The entry for the sons of the 2nd Viscount Hampden duly supplied the details of 2nd to 6th quarter. However, the blazon for Brand was given as “Azure two swords in saltire Argent hilts and pommels Or between three escallops one in chief and two in fesse Or (Brand 189-)“. It seems that the 1st Viscount Hampden (2nd creation) had Arms recorded or granted in 1895 [Vol. LXVIII fol.258]. The Brand Arms of the bookplate match those of Brand of Gray’s Inn and Suffolk 1616. One wonders if the Brands of Glynde Place had assumed the Gray’s Inn Arms and it only came to light with the ennoblement of the 1st Viscount?